The Goldhead Hairy Olive Daamsel Nymph is one of the highly successful Hairy Goldhead Nymph series of flies. Thread : Black, green or olive 6/0 or 8/0. Tail : Arctic fox fur, olive. Ribbing : Olive tinsel thread. Body : Olive rabbit fur dubbing, thin. Underwing : Olive fur with guard hairs. Thorax : Olive dubbing well picked out. Overwing : Grey fur with guard hairs. 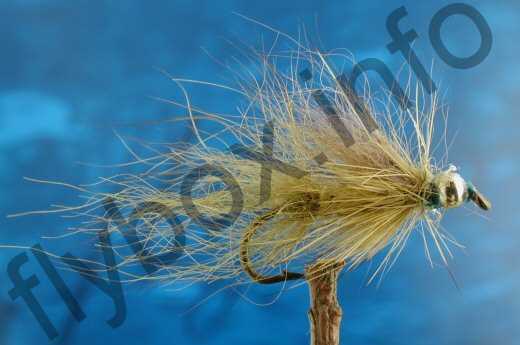 Hackle : Olive squirrel tail. Currently there are no comments about the Goldhead Hairy Olive Damsel Nymph fly pattern from other fly fishermen yet.